The Dallas Cowboys (1-1) will face the Chicago Bears (0-2) with their backup quarterback in Arlington Sunday night. According to NFL.com's Ian Rappaport, starting quarterback Jay Cutler will miss two to three weeks with a thumb injury on his throwing hand sustained in their season opener against the Houston Texans. 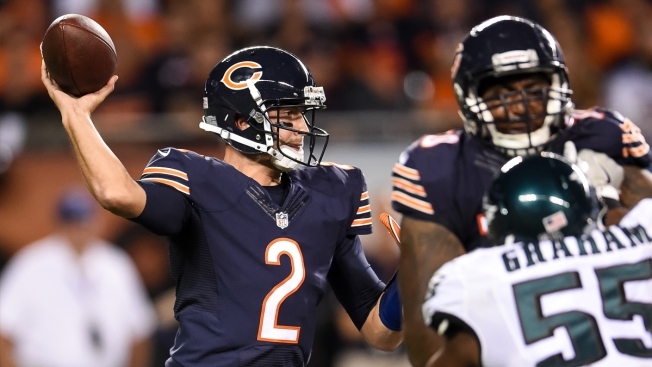 Backup quarterback Brian Hoyer will take over starting duties for Cutler, who left the team's Week 2 game against Philadelphia due to the injury. Hoyer finished Monday's game against the Eagles, completing 9 of 12 passes for 75 yards. In 44 career games, Hoyer has completed 58.3 percent of his passes for 7,241 yards (7.2 yards per attempt), 38 touchdowns and 26 interceptions. He's started 26 games in his career, including nine for the Texans last season. The Bears are the fifth team for the 30-year-old Hoyer, who also spent time with New England, Arizona, Cleveland and Houston. The Bears also announced the loss of players at every level of their defense after Monday's game. The team announced that outside linebacker Lamar Houston is out for the season with a torn ACL. Defensive tackle Eddie Goldman injured his ankle in the game and will miss four weeks. Inside linebacker Danny Trevathan reportedly suffered a sprained thumb that will require surgery. There is no word yet how much time he will miss. Defensive backs Bryce Callahan and Adrian Amos suffered concussions Monday and were undergoing concussion protocol. Their status is uncertain.